Do you write stories or poems or fiction of any type? Want a bit of help with inspiration and motivation? 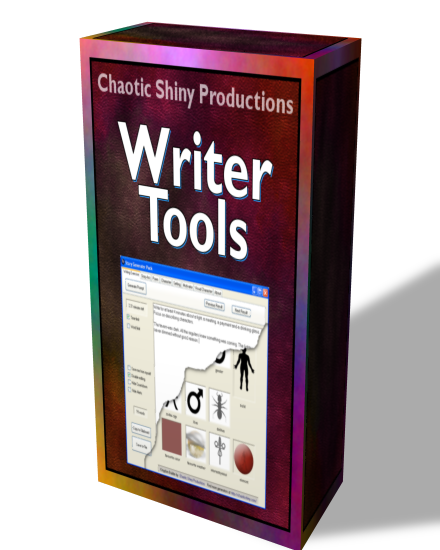 Then help yourself to some Writer Tools, made just for someone like you. Generates characters, settings, story arcs and more for any genre. If you're stuck on a plot point or character idea or setting description, Writer Tools will help break you out of your rut. And when all else fails, the Motivator will give you reasons to keep going. 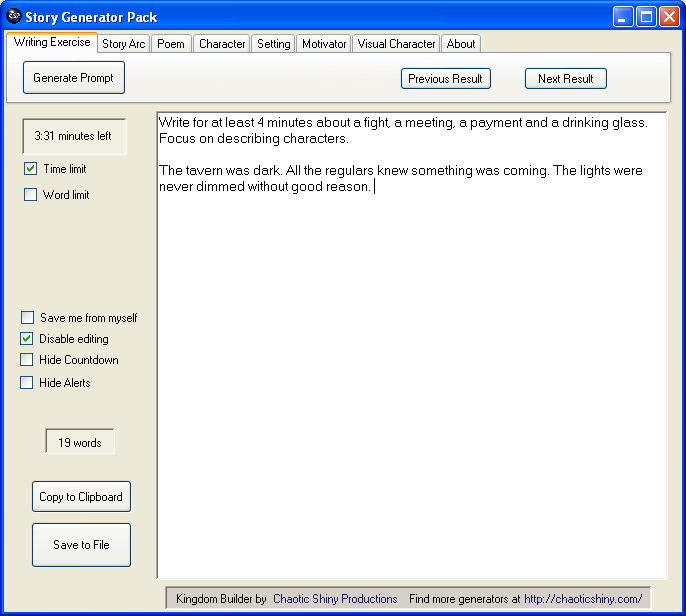 The Writing Exercise Generator gives you a prompt and either a word or time limit in which to complete it. You can also use features such as "Save me from myself," which prevents you from rapidly generating prompts until you get the perfect one, and "disable editing," which will prevent you from deleting anything as much as you might want to. 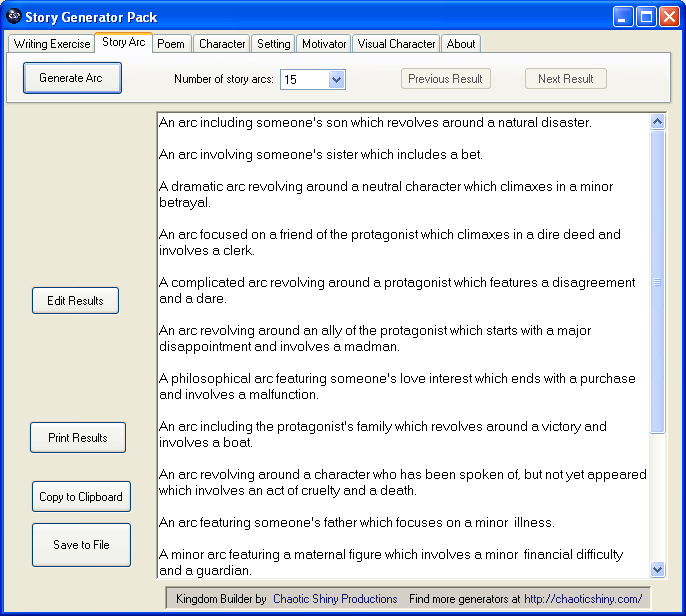 The Story Arc Generator creates plot arcs for you with a brief description of some of the characters and events involved. 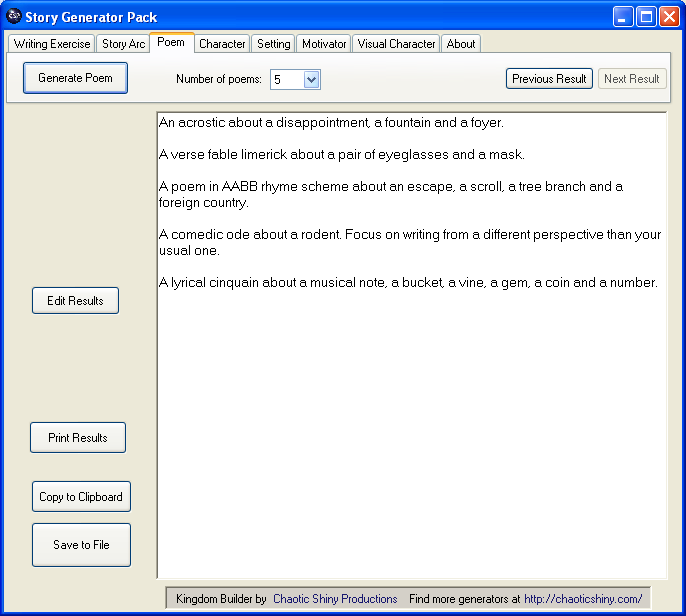 The Poem Generator suggests a genre and theme for your next poem, plus a few items or events to include. The Character Generator creates a character for your story, potentially including their relationship to the protagonist and when they appear. 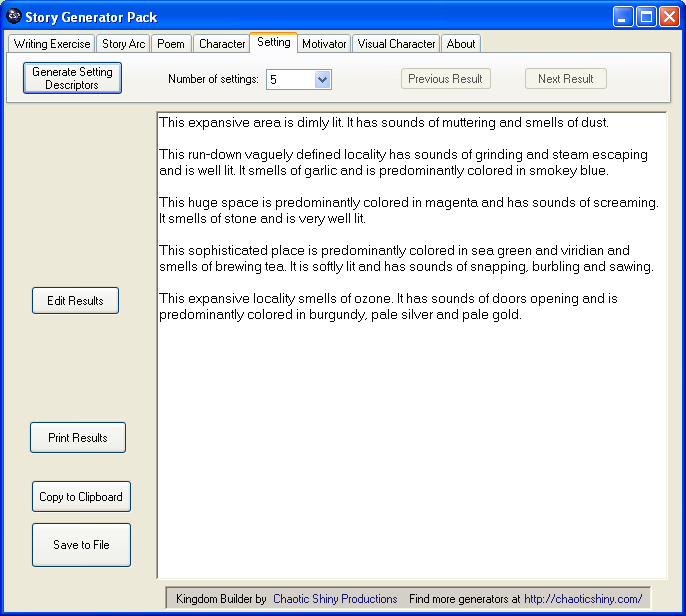 The Setting Generator describes places in terms of colors, smells, and sounds. The Motivator provides you with an infinity of silly reasons to write just a few more words or for a few more minutes. The Visual Character Generator is a new and different way of inspiring characters. 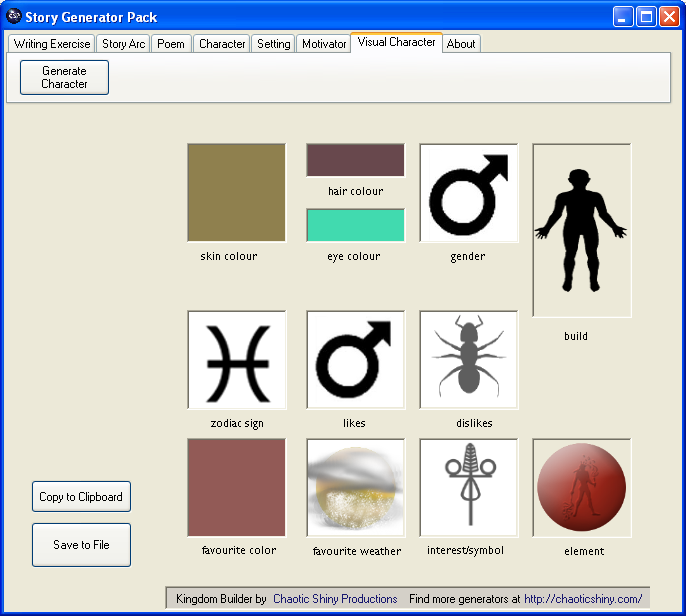 It's a graphical generator that shows you the character's coloring and build, and a selection of icons with hints for their potential personality. Edit results from inside the program, tweaking formatting and adding or deleting information. 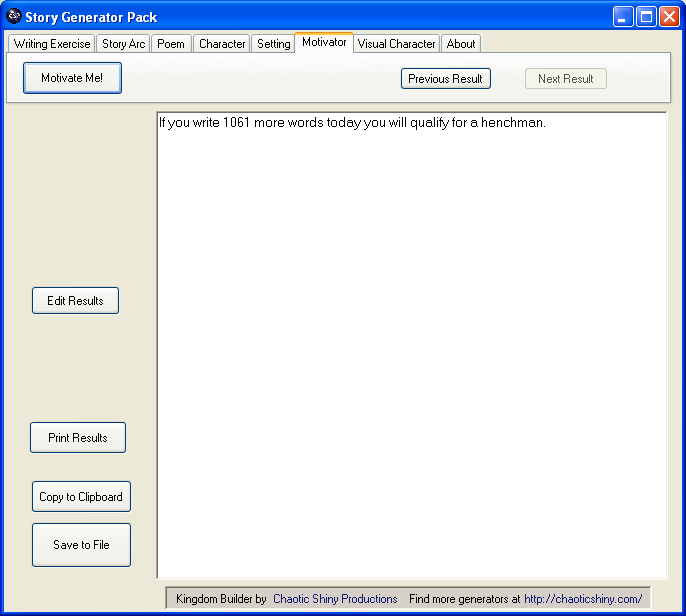 Print results directly from the Writer Tools Pack - no need to even open another program! Save results to a file - no need to copy and paste. Saved Results allow you to keep a history of your last 10 results this session with each generator - no more accidentally clicking a button and losing results forever! Your Options panel allows you to save your window size, menu positions and most recent results across sessions. You can open up the Character Builder and find it looking exactly the way it was when you closed it. As with all of our products, Writer Tools comes with our 30 day money back guarantee. Don't like the product, or it doesn't work on your computer? Let us know, and we'll refund your money. If you think this is interesting, you might also find the Magic Generator Pack useful. Want to find out about new products, and get sneak previews of upcoming products, plus mini-contests and free stuff? Sign up for the newsletter!